We use real time in vivo imaging to monitor disease progression and measure cellular response to therapies in live animals. 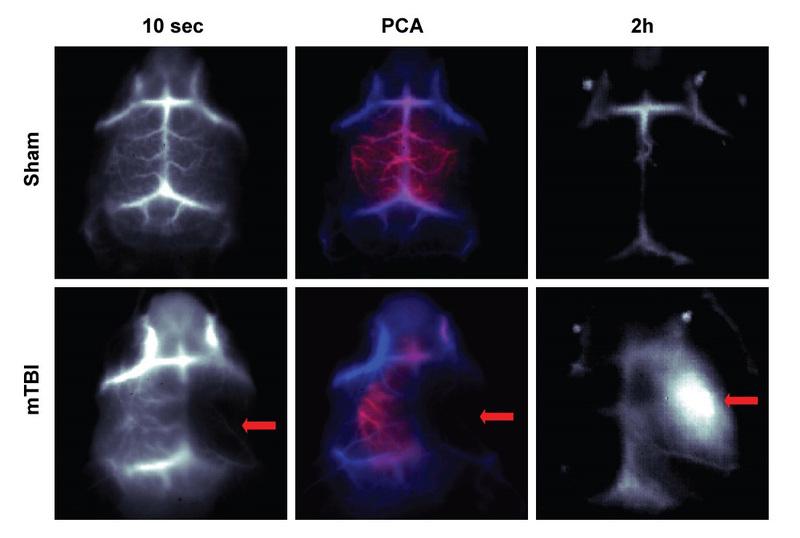 We developed bioluminescence reporter mice for monitoring TGF-beta signaling. In collaboration with pioneers in the field, we employ near-infrared fluorescence imaging to monitor neurovascular damage and blood-brain barrier leakage. These imaging techniques allow longitudinal and noninvasive monitoring to assess disease progression and therapeutic effects in live animals. NIR-II in vivo imaging of blood flow and BBB permeability. IR-E1, a novel molecular fluorophore in the second near infrared window (NIR-II), was injected intravenously into mice with sham (top panels) and mTBI injury (bottom panels). At 10 sec post IR-E1 injection, blood flow was equal in both hemispheres of sham mice, but reduced in the injured right hemisphere after mTBI. PCA of 100 frames from dynamic imaging, resolving arterial (red) and venous cerebral vessels (blue). Two hours after IR-E1 injection, no significant fluorescence was retained in sham mice, but massive accumulation of IR-E1 was found in the injured hemisphere of mTBI mice. (Adapted from Adv Mater 2016;28:6872).